Deputy Jeff Sherman is a 10-year veteran of the Sonoma County Sheriff’s Office and has been assigned to the City of Sonoma for the past 7 years. 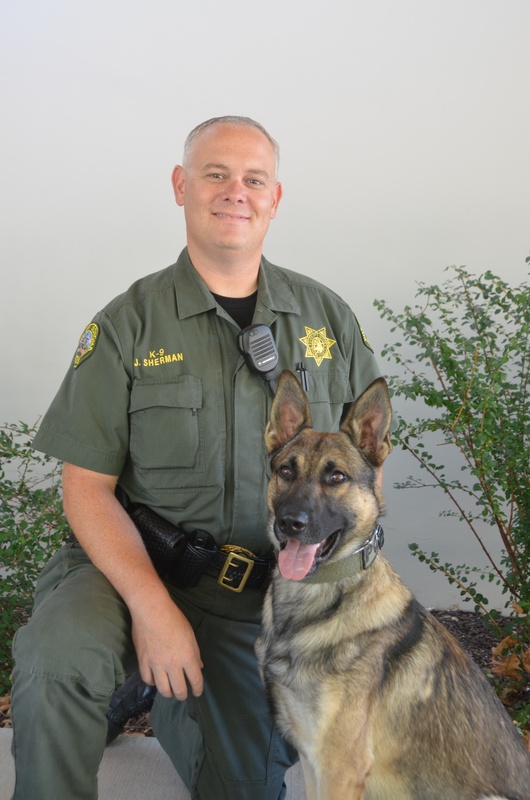 Deputy Sherman was chosen as the first K9 Handler for the City of Sonoma Police Department and has been partnered with K9 “Dickie” since 2013. K9 “Dickie” is a five year old dual purpose Belgian Malinois who was imported to the United States from the country of Hungary. Deputy Sherman and K9 “Dickie” attended a 200 hour P.O.S.T. approved Canine Patrol School. K9 “Dickie” was taught how to search for, locate, and alert to hidden subjects, apprehend resisting and fleeing subjects, and search for discarded articles. They also attended a 200 hour P.O.S.T. approved Narcotics Detection Course, where K9 “Dickie” was taught to alert to the odor of four different illegal substances (marijuana, cocaine, heroin, and methamphetamine). Deputy Sherman and K9 “Dickie” receive a minimum of sixteen hours of continued training per month. The training entails both narcotics detection work and patrol work. The narcotics training includes residential searches, vehicle exterior and interior searches, commercial building searches, luggage searches and parcel searches. Deputy Sherman and K9 “Dickie” enjoy being a part of the City of Sonoma Police Department, as well as serving and protecting the citizens of Sonoma.